Tootsies recently highlighted the latest Alice + Olivia collection during a 3-day trunk show in Dallas. Once again, Alice + Olivia proves that clothes can be whimsical with a bit of edge thrown in. The collection was a mix of feminine silhouettes and streamlined styles. The collection featured a mostly neutral color palette with pops of light pinks and the essential black and white. One of the components that I really liked was the leather-trimmed details on the tops and pants. And my favorite piece from the collection was the pink flamingo blouse, of course! I enjoyed being able to see and touch the clothes in person. If you didn't get a chance to see the collection yet, stop by Tootsies at the Plaza at Preston Center in Dallas. They have a great selection of the summer line as well as previous Alice + Olivia collections. If you don't live in the Dallas area, you can also visit the Tootsies locations in Houston and Atlanta. Plus, you can shop Tootsies' online boutique at Farfetch. P.S. 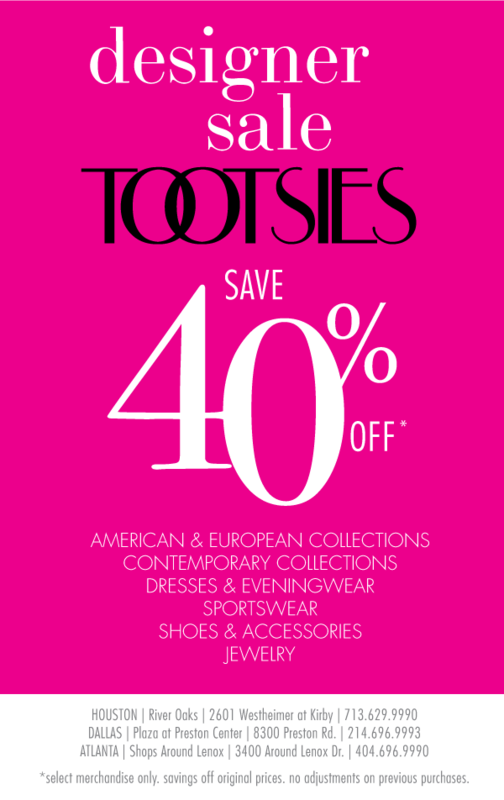 - Tootsies is also having a great sale right now. I found a Kate Spade dress for 70% off! You can't beat that. What designer steals will you discover at Tootsies this season?